Home / Products / Gifts / GIFTS FOR HIM / *You Are Plantastic! This gift hamper is designed for the bearded one in your life and includes a great combination designed to make them feel good! 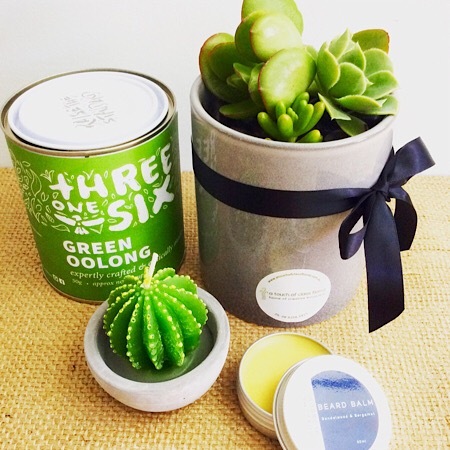 You Are Plantastic combines a ceramic pot of succulents (approximately 15-20cm in height), a tin of Threeonesix organic tea 50g (tea will vary according to availability), a Possum and Blossom beard balm and a mini cactus candle. We will gift wrap them for you in a hamper tray and tie it up with a bow!